At one time in my life, I was an avid upland bird hunter. Some days, I collected a grouse or two, while other days I harvested woodcock. There were also special days when I returned to the car with both species: a true mixed bag! 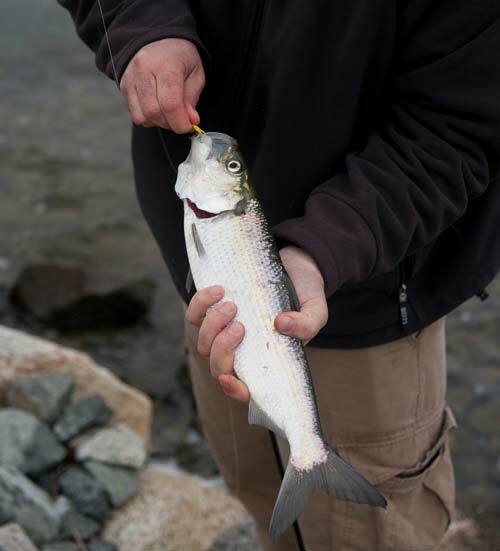 Nowadays, my pastime—especially in the spring—is the active pursuit of both schoolies and shad, often at the same time, to collect that proverbial mixed bag. Arriving ahead of the larger keepers and coveted cows, schoolie stripers are the first bass to show along our New England coast. 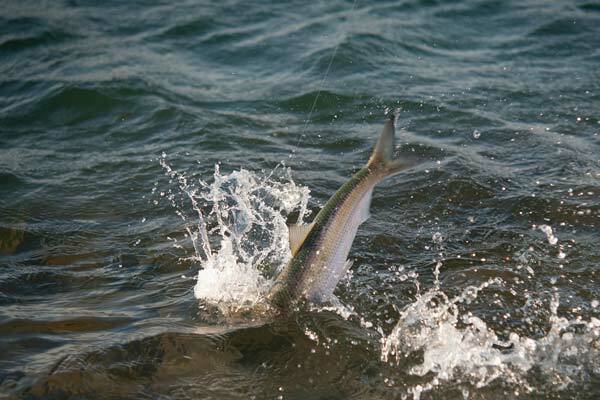 Generally showing up between mid-April and mid-May, schoolies are famous for moving into the warm waters of our coastal rivers and estuaries to gorge on the abundant baitfish found there. These backwater locations provide fantastic opportunities for fly-fishing aficionados, like me, to catch their first stripers of the year. 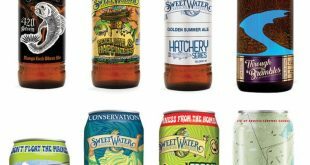 But, stripers aren’t the only migratory fish of the season. Within a few weeks—usually starting in mid-May, both American and hickory shad begin migrating into our Northeast tributaries as well. 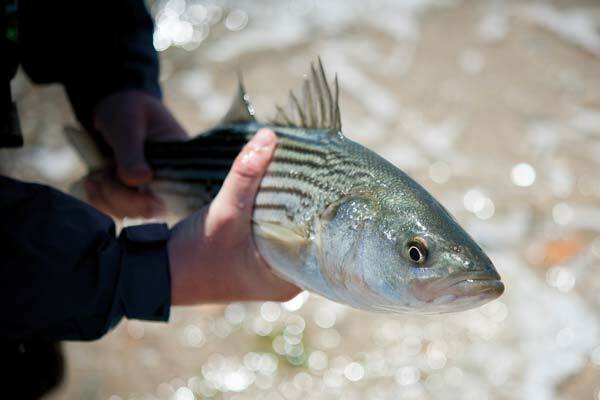 Small stripers arrive in New England estuaries between mid- and late April, seeking out warm water and baitfish. Of course, I don’t understand the psyche of either species, but I doubt that stripers and shad get along. In fact, because they’re found in such proximity, stripers and shad remind me of a couple of street gangs: they might inhabit the same neighborhoods, but they protect their own turf. What I appreciate most about their living arrangements is that it’s often possible to catch both species on my early season outings … that sought-after mixed bag! Being a transplanted landlubber from fly-over country, I was well into my 50s before I caught my first shad. In fact, I didn’t even know what a shad was. Standing waist-deep in Rhode Island’s Narrow River, all I knew when an unknown fish jumped as high as my head was that it wasn’t a striper. I had to consult McClane’s New Standard Fishing Encyclopedia to determine it was a hickory shad. Since that day, I’ve been hooked on catching these fish. 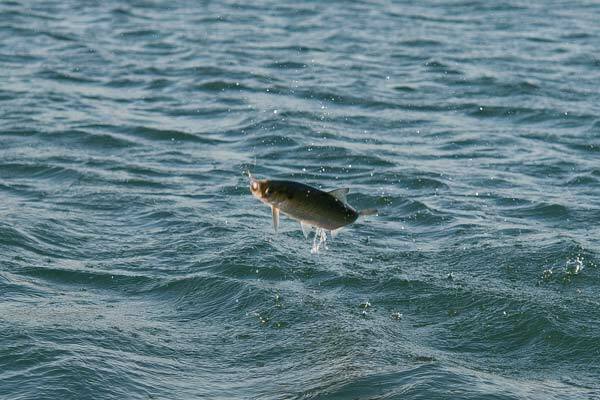 Hickory shad’s fighting, leaping, and acrobatic antics are legendary. Hickory shad’s fighting, leaping, and acrobatic antics are legendary. They are downright fun to catch. There’s something uncanny about watching your fly line disappear in the depths and having a hooked fish rocket out of the water ten feet away. Though most of the shad I catch weigh only one to two pounds, these powerful fish, with their slab-sided bodies pulling in the current, put up a heck of a fight on the end of a fly line. 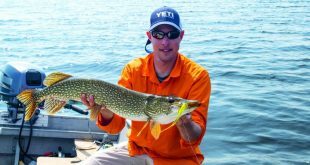 Unfortunately, there is a certain stigma attached to these fish, and many fly-fishers aren’t interested in targeting them while stripers are around. One acquaintance recently informed me that he doesn’t like shad because they’re oily, which is true, and they smell, which is also true. But, most fish are somewhat oily, and all fish smell, so, what’s the big deal? I enjoy catching shad when targeting stripers, even if they are slimy and smelly! 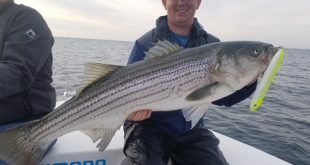 Most fly-fishers would agree that the best times to fish for both stripers and shad are the first couple of hours before dusk and/or the first two to three hours after daylight. Daybreak is my favorite time to try for stripers, but with shad, I have my best luck catching them about an hour or so before sunset. At that time of day, you can often hear these fish splashing in the water as they chase minnows on the surface, alerting you that there are at least a few fish in the area. Shad have soft mouths, which often results in missed bites and pulled hooks. However, if conditions are right, it is possible to catch both species throughout the day. I’ve found that dark, cloudy, rainy days provide the best conditions and, although wind is the bane of fly-fishers, I’ve also discovered that breezy days, which create a slight chop on the water, are also productive. 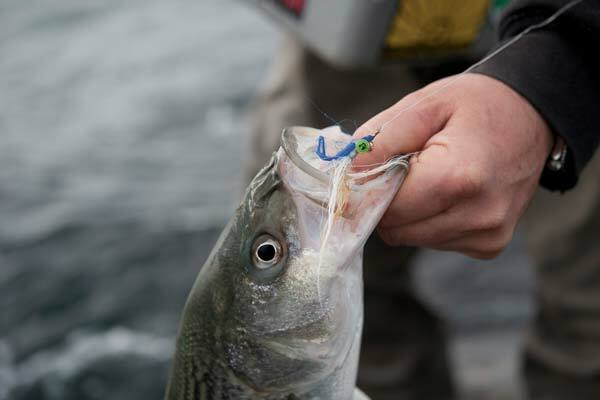 Of course, moving water is critical when targeting both stripers and shad and, in my biased opinion, I believe the best striper bites occur during outgoing tides, while the shad are more aggressive on the incoming. This makes for a great (and extended) day on the water: you can fish the incoming tide, take a break, then resume fishing the outgoing (or vice-versa), with the expectation of catching at least one of the species. Hickory shad often take to the air after feeling the hook. Regarding equipment, for my schoolie and shad forays, I use a couple of medium-action, 8-weight rods. These sticks are a delight to use, balance well with my casting stroke and, with their softer, medium actions, handle and feel almost like lighter, 6-weight rods. Shad, in particular, like to hug the bottom. So, in addition to standard 20-pound backing, to get my fly further down in the water column, my reels have high-density, Class-V, sink-tip line. Because I want to work deeply-sunk flies, I also tie on short, 7 ½-foot, 16-pound nylon tapered leaders at the terminal ends. I don’t tie my own flies, so my striper and shad fishing flies are all generic patterns, usually ordered by mail. I use two patterns, Deceivers and Clousers, tied on size 2, 4, and 6 hooks. For color combinations, I believe white is important; therefore, my Deceivers are all dressed with black over white, green over white or, the color combination I use most often, blue over white. Although Deceivers are certainly productive, I’ve recently started using small Clousers almost exclusively. 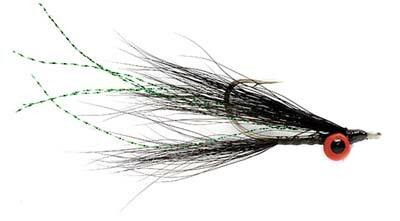 In fact, if I was limited to only one fly for my schoolie and shad fishing, I’d choose a size-6 Clouser. It’s often maintained that commercially-tied flies are overdressed, as related in the adage, “flies are only tied to catch fly-fishers, not fish.” And, one of the best fly-fishers I know claims predator fish see only the silhouette of their prey. So, following along those lines, I think nothing beats a sparsely dressed size-6 Clouser. Hickory shad eagerly attack small, brightly-colored flies. This isn’t meant to be an endorsement, but every year I order an assortment of size-6 Clousers from Orvis. Their flies are sparsely dressed with a bit of tinsel, and the color combinations I use are gray/white and red/white. These small flies are easy to cast and are very productive for both schoolies and shad. Stripers can be found singly or in small schools practically anywhere, even cruising shallow flats, but shad are usually found in deep water. Although good locations to find shad are current breaks behind rocks, pilings, and bridge abutments, I particularly like to work my flies along sandbar drop-offs, channel edges, and into holes found in deeper water. This striper fell to a sparsely dressed Clouser Minnow. I know it’s a cliché, but shad really do stack up like cordwood. They cruise around in extremely tight groups, and if you find one, you’ll usually find them all. Blind-cast until you find a school, and you’ll have a blast catching one fish after another. Incidentally, if you fly-fish in tidal rivers, you’ll probably have to share the water with pleasure boats and pesky jet skis. This might sound downright strange, but I’m convinced that the noise and commotion from these watercraft stir up the baitfish, which triggers a predatory response from both stripers and shad. On numerous occasions, immediately after watercraft have annoyingly sped past me, I’ve caught numerous fish, and I think this was more than coincidental. Whenever I’m fishing, I pay attention to what other anglers are doing. It seems all fly-fishers have their theories on how to work their flies. For instance, one successful fellow I know retrieves his flies with continuous but excruciatingly fast foot-long strips. Another fly-fisher has a technique of working his flies with three quick 6-inch strips, then pausing for a few seconds before repeating the procedure. He claims that the bass, and especially the shad, hit on the pause. Personally, I don’t have any strategy. 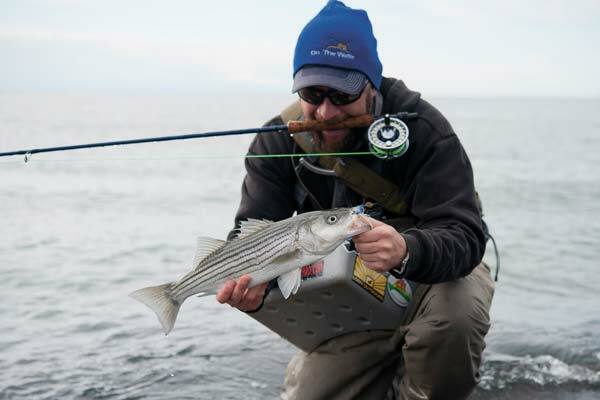 Under normal tidal conditions, when targeting both stripers and shad, I’ll make long, cross-current casts, let my line sink, and then retrieve my fly with a series of steady, but not particularly fast, foot-long strips. 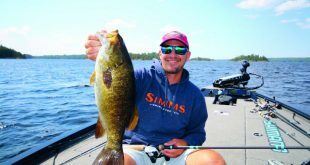 However, if there’s a strong tidal flow, or if I’m catching only shad, I’ve found that simply dead-drifting the fly, while tossing in a few mends to slow the drift and get the fly down deeper, can be highly effective. With stripers, I get solid hooksets and rarely lose a fish. But, with shad, it’s a whole different ballgame. 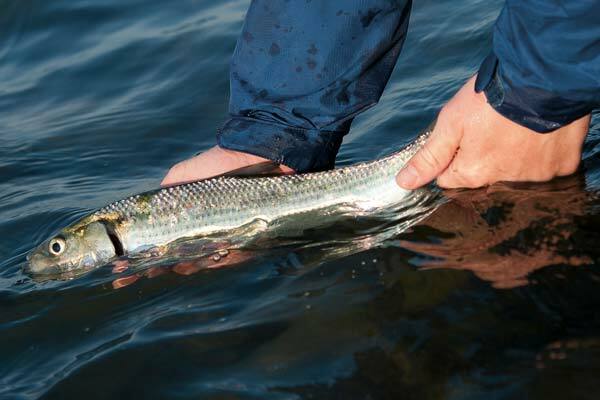 Whereas stripers really hammer a fly, the take of a shad is usually much subtler. In fact, these fish frequently bump a fly without getting hooked at all. Most significantly, shad have soft jaw tissue and, when combined with their doggedly strong pulls and leaping acrobatics, I probably lose at least 30 percent of the shad I hook. Truthfully, I don’t know what the solution is. Even with a good hookset, if you yank the fish in too quickly, chances are the hook will pull out. Ditto if you wait and play the fish too long. Therefore, whenever I get a hook-up, I try to land the fish with a slow, steady pull by directing the fish into shallow water. Sometimes I am able to land it and sometimes I am not. Like most fly-fishers, I prefer to catch stripers. But, variety is the spice of life, so when I am looking for that exciting mixed bag, or when the schoolies simply aren’t schooling, I’ll take a leaping shad on the end of my fly line anytime.